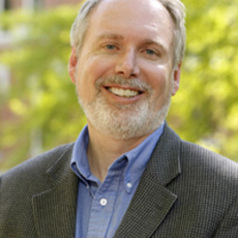 Joel Harrington is a historian of Europe, specializing in the Reformation and early modern Germany, with research interests in various aspects of social history. His most recent book is Dangerous Mystic: Meister Eckhart’s Path to the God Within (Penguin Press, 2018). His previous monograph, The Faithful Executioner: Life and Death, Honor and Shame in the Turbulent Sixteenth Century (Farrar, Straus & Giroux, 2013), has been translated into thirteen languages and was named one of the Best Books of 2013 by The Telegraph and History Today. Other publications include The Unwanted Child: The Fate of Foundlings, Orphans, and Juvenile Criminals in Early Modern Germany (University of Chicago Press, 2009), winner of the 2010 Roland H. Bainton Prize for History; Reordering Marriage and Society in Reformation Germany (Cambridge University Press, 1995; paperback 2005), one of Choice’s Outstanding Academic Titles of 1996; The Executioner’s Journal (University of Virginia Press, 2016); and A Cloud of Witnesses: Readings in the History of Western Christianity(Houghton Mifflin, 2001). Projects currently underway include a study of the sixteenth-century mercenary Hans Staden, who published an influential account of his captivity among the Tupinambás of Brazil, including graphic accounts of ritual cannibalism.